In her final illness Gemma's last trials were terrible; her lungs were deteriorating and she struggled to breathe; racked in pain she repeatedly vomited blood, and the devils attacked her with a dreadful fury. At one point, the devil appeared to her in the form of a serpent and sought to wrap himself about her and choke her. Many were the witnesses to Gemma's extraordinary holiness amidst the trials and struggles of her final illness. Especially present were the members of the large Giannini family who went on doing all what they could in an exemplary way, and also the Barbantini Sisters, from the Order of St Camillus de Lellis, who helped nurse Gemma especially at night. On Wednesday of Holy Week 1903, she received Viaticum. On Good Friday, she said moaning to Cecilia Giannini, who had helped nursing her until then: «Don't leave me until I'm nailed on the cross. I have to be crucified with Jesus. Jesus told me that his children have to be crucified with him». Then she went into a painful ecstasy, she ope­ned her arms and remained motionless till 1:30 pm. 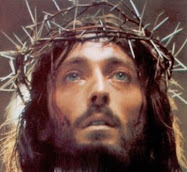 Later on Ms. Cecilia wrote to Father Germano: «Look at an image of Christ Crucified and you will see her fi­gure». Gemma suffered terribly through Holy Saturday mor­ning. At about 8:00am, she was given the Sacrament of the Sick and Viaticum. Before midday, Monsignor Volpi was called for. When he arrived, Gemma asked him to exorcize her. However he refused to satisfy this request be­cause he thought she was already out of consciou­sness and a prey to delirium. Therefore he just ab­solved her. Around this time Gemma also asked to see her spiritual director, Father Germano, so Cecilia Giannini reminded Gemma that Father Germano was currently in Rome. Gemma answered: «I won't ask anything else; I ha­ve sacrificed everything to God. Now I am, prepa­ring myself to die». A few hours before passing away, she took a cru­cifix in her hands and said looking at it: «Jesus, you see, I can bear no more. If this is your will, take me with You. Jesus, I recommend my soul to Thee!» Then she raised her eyes to a picture of the Virgin Mary on the wall opposite and added: «My Mother, I commit my soul to you! Tell Jesus to have mercy on me!». Present were the parish priest, her aunt Elisa, almost all of the Giannini family and two Barbantini Sisters. Gemma then kissed the Crucifix that she held in her hands, and then placed it on her chest and keeping both hands on it she closed her eyes and remained motionless, as if in prayer. The Parish Priest, Rev Abbot Angeli, of the Canons Regular of the Lateran, arrived and began the last prayers. She rested her head on Giu­stina's shoulder: then she breathed her last serenely and peacefully, with a most beautiful smile and two tears streaming down her face. It was 1:30pm on Holy Saturday, April 11th, 1903. 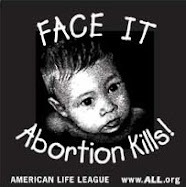 Rev Abbot Angeli had stopped mid-prayer and asked "Is she dead? " He later said "I have been present at many death beds, but never have I seen anyone die like Gemma, without any precursor sign...not even a panting breath. She died with a smile which remained on her lips, so that I could not convince myself that she was dead." Father Roberto Andreucetti, declared: «I wanted the emblem of the Passio­nists to be put on her dress over her breast because if Gemma had not been a Passionist as a matter of fact, she had always been such at heart and in her deepest desire». There was a crucifix over her breast, which she had been holding; a rosary was tied round her right wrist; she had her usual black dress on, and a black veil on her head. She was as beautiful as an angel, calm, serene, with a most beautiful smile which remained on her lips.. News spread quickly of the death of the girl who was said to be a saint, so that people of all condi­tions came and saw her, spontaneously beginning a veneration that continues even to this day. Some touched articles of devotion to her, others plucked flowers from her crown and even strands of her hair, which in their veneration they wished to have for a relic. The funeral took place on Easter evening. A crystal pipe, which contained a parchment with Gemma's memoir on it, was enclosed in her cof­fin together with her body. The venerated body was buried in a privileged grave. It was only then that Father Germano arrived, as Gem­ma had fortold. Also it seems that the operation confirmed that Gem­ma had died of tuberculosis. In fact, a nun that was present said: «I myself saw the tubercular caves in her right lung». The first burial which the Gianninis had taken care of, was near the open galleries near the bounda­ry wall. Because of the devotion of many of the faithful, on October 7th, 1908 with approval of ecclesial and local authorities, her body was exhumed and transferred to a more honorable place of burial nearby, On the initiative of her spiritual director, Father Germano, a little monu­ment was erected on the grave thanks to the offe­rings of many people. "The Life of Gemma" writes a Priest rector of the Jesuits to Father Germanus, "has given me immense joy. For my part, I confess that I cannot keep from invoking her continually, nor from addressing her as Saint Gemma. You, Reverend Father, by publishing the biogra­phy of this Saint and her letters and ecstasies, have accomplished a mission for the good of innumerable souls now and in the future that is worth more than hundreds of our ordinary missions .... I have given discourses on this saintly virgin in retreats given to religious communities, and I will speak of her all the rest of my life and cause her to be known and earnestly invoked. Fur­thermore, I have promised in gratitude to contribute to the best of my power, even by obtaining subscriptions, to the Cause of her Beatification. Gemma without doubt will be canonized, and that before long, by the oracle of the Church, and will be numbered among the greatest Saints that we venerate on the altars. That is my opinion." And how right was this dear Priest! Was it not an oracle of the Church that Gemma was canonized only 37 years after her death! Such a speedy canonization is practically unheard of, especially at that time. Philomena Bini of Pisa, aged 72, suffered for a long time from malignant stomach disease, pronounced by several physicians to be a malignant cancerous ulceration. Various prescriptions were tried, more with the object of lessening pain than with hope of cure. Finally, it was openly declared that any further attempts to cure such a disease in a woman of her age, reduced to such a state, was useless and so medical assistance was discontinued. Meanwhile, the parish priest visited her daily for months and administered to her the last Sacraments. In this extremity, a good lady of the city, hearing of Gemma, felt inspired to implore her intercession. Having procured a relic of Gemma, she hastened to the bedside of the dying woman. She made all present kneel, said some prayers to the Blessed Trinity in honor of the Servant of God and applied the relic to the patient. Almost immediately the sick woman, who for a long time had not closed her eyes owing to the violent pains that tormented her, fell into a placid sleep that lasted the whole night. In the morning, on awakening, she found herself perfectly cured, without the least remnant of the pains that had tormented her for five years. She asked for food, and ate with appetite four times that day, taking broth, meat, biscuits, milk and eggs. Imagine the astonishment of the doctor when Philomena Bini, whom he believed dying, presented herself to him in robust health. Not trusting to what he saw, he wished to examine her with electric rays, and finding that all the cancerous disease had gone, he exclaimed: "This is a miracle wrought by God!" Many months have passed since that miracle, and Philomena Bini continues to be in good health, such as she had not previously enjoyed for many years. lsolina Serafini of Vicopelago, near Lucca, was suffering for for ten months from acute meningitis that tormented her night and day, without her deriving any benefit from the remedies ordered by her medical physicians. From December, 1906, to October, 1907, she was unable to sleep for more than an hour in each twenty-four hours, due to the dreadful pains. While in this sad state, she felt inspired to have recourse to Gemma and invoked her with confidence, saying: "I shall take it as a sign that you are in Paradise and a Saint, if you effect my cure; and I promise to publish it immediately." So saying, she lay down on her bed; miraculously, the pains left at the very same moment. Not a vestige remained of the violent and painful meningitis. She fell asleep, and from that day, the 10th of October, 1907, up to the present, she has not suffered once from her head, and is always able to sleep soundly. "This is the exact truth," she says in the written declaration she sent me, "and I confirm it on oath, I, Isolina Serafini." Due to the continued devotion of the faithful and also the numerous reported miracles attributed to her intercession, the Church authorities decided to start the canonization process four years after her death. The ordinary Trials began on October 3rd 1907 at Lucca; the Apostolic ones for her beatification be­gan on January 20th 1922, at Pisa. 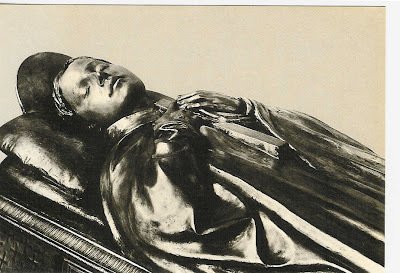 On May 14th 1933, Pius XI declared her Blessed and on May 2nd, 1940 Pope Pius XII solemnly canonized the «Poor Gemma», -a name she used to refer to herself. As Gemma had worked for and predicted, the Passionist Nuns came to live in community in her hometown of Lucca on March 16th, 1905. 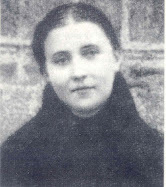 The Mother assigned to the new monastery, Mother Giuseppa, and six other nuns, for a total of seven, just as Gemma had seen in a vision at the end of January, 1900. In the years following, for various reasons, they were forced to move to different locations within Lucca, in years 1908, 1917, 1920 and 1922, eventually moving into a convent and oratory. However, even this convent and the oratory soon be­came too narrow for the ever increasing number of the nuns and for the development of the cult in honour of Gemma. Therefore, in September 1935, they laid the foundation stone of the present Monastery-Sanctuary in the area next to the old house, which was later demolished. In May 1940, the month that Gemma was canonized a Saint, the building works were virtually finished. Her corpse was transferred from the graveyard to the Oratory outside Elisa Gate on September 4th 1923. On September 8th 1933, on the occasion of Gem­ma's Beatification, her mortal remains were carried shoulder-high to St. Martin's Cathedral for the festi­vities at the diocese. On October 2nd, 1933 the venerated body was re­turned to the silence of the Monastery-Sanctuary that is named after her. 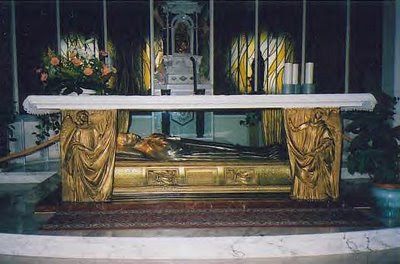 On April 11th 1953, the 50th anniversary of St Gemma’s death, they consecrated the main altar, inside which Gemma resides, and blessed the new life size statue-urn that contains Gemma's mortal remains. With this we recall the occasion that Gemma, on being refused by the Passionist Nuns at the Convent of Tarquinia, exclai­med with unusual vigour: «They don't want me now that I'm alive, they will take me when dead». One day she also had said to her Aunt Elisa: «Aunt, you see, they don't want me when alive, but they will look for me when dead!». In March 1901, in a letter to Monsignor Volpi, the Saint had innocently revealed him that Jesus had said to her: «Assure him that it is I, Jesus, who talks with you. Within some years, you will be a Saint, will do miracles and will be raised to the altars». Two weeks ago my wife and myself had vacationed in Lucca and had the privelege of visiting the Cathedral where Saint Gemma is buried. The next day we called to see if we could get a tour of her house but were told it was too short notice to set up an appointement with a volunteer. Disappointed for sure but we understood. We decided to return to the Cathedral the next day to buy a few more cards and relics. Upon entering the gift shop we saw that there were two american girls in the shop and the volunteer in the shop was trying to tell the girls about Saint Gemma. (They are very devoted to her...). I volunteered to help translate as the man made a valient attempt but his english was a bit limited.) All were happy and a lot of Saint Gemma stories were told. I then explained to him that my wife and myself tried to set up an appointment to see the house but were turned down due to short notice. He said: "Tell you what, all of you meet me after 6.00 PM after mass and I will give you a tour of the house as I am a volunteer!". You can imagine our joy!. 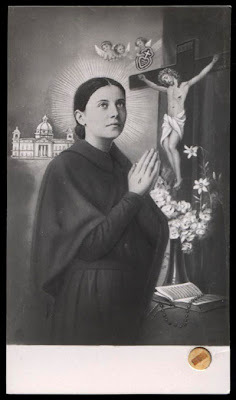 I can only believe Saint Gemma wanted us to visit her house were she got the stigmata. We were overjoyed and I cannot describe the blessing we all received. The next day we also went and found the Gianninni house were she lived after her parents died and got a tour by one of the good nuns there. Finally we found the house she died in and stood in front. Words cannot describe the feelings and how blessed we felt. I will send pictures to the moderator of this site shortly so he can post them if he desires. Thank you SO MUCH for sharing the story of your blessed visit to the Monastery of St Gemma, and the other St Gemma places. Without a doubt Gemma arranged this providential meeting between you (and your wife), the volunteer and the pilgrims from America. It was most certainly a special grace and blessing for all of you. Thank God for His kindness, and may He be blessed through his servant, Saint Gemma. And I would like to receive, as you suggested, any photos that you would like to share. I pray that St Gemma may always be close to you, and may she lead you ever closer to Jesus, her beloved Spouse. Holy Gemma, your love and presence are felt. Please pray for us all Holy Gemma. This Lady to me may have been one of the most beautiful females both inside and out to ever grace this world. Period! She is in Paradise. Quite a Woman indeed. 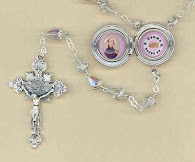 St Gemma and St Bernadette...Love them both.